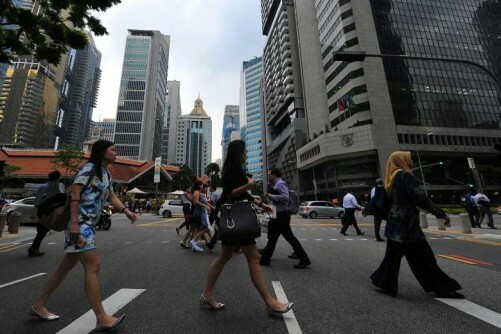 SINGAPORE - Overall unemployment held steady in the first three months of this year, while the unemployment rate for Singaporeans and Permanent Residents improved. The seasonally adjusted unemployment rate was 1.9 per cent as of March 2016. The rate for citizens fell to 2.6 per cent, from 3 per cent in December, and that for Singaporeans and PRs combined was 2.7 per cent, down from 2.9 per cent, according to preliminary estimates released by the Manpower Ministry (MOM) on Thursday (April 28). This was largely because a smaller proportion of young people aged 15 to 24 were working or looking for work, MOM said. The ministry's report also showed that employment growth of 11,400 in the first quarter of the year, driven mainly by services, was higher than in the same period last year when employment contracted by 6,100. The first quarter growth was still lower than the seasonally high growth in the fourth quarter of last year. The manufacturing sector saw a sixth consecutive quarter of falling employment, with 2,000 fewer workers in March than in December. Total employment reached 3,667,600 as of March 2016. Although the services sector saw increased hiring, layoffs in the sector also increased last quarter to 2,500. Overall, about 4,600 workers lost their jobs in the first three months of this year, higher than the 3,500 who did so a year earlier, but lower than the 5,370 laid off in the final quarter of last year. MOM said this was due to on-going business restructuring. The Monetary Authority of Singapore said on Wednesday (April 27) in its biannual macroeconomic review that lower labour demand and supply could lead this year to a slight rise in unemployment rates, modest job creation, and rising redundancies in sectors facing weak external demand and undergoing restructuring.